Details on these programs are below. Ss. Peter and Paul New Family Scholarship: K-8 families that are new to Ss. Peter and Paul School may be eligible to receive a needs based scholarship. If a family meets the income and household size thresholds below, they may be eligible for up to 75% off tuition. If a scholarship is awarded, the student will receive this scholarship for the remainder of the student’s time at Ss. Peter and Paul. Information on how to apply can be obtained from the school principal, Mrs. Deborah Lester, dlester@ssppschool.com. Families interested in Ss. Peter and Paul School may be eligible to receive tuition assistance from the BISON Children’s Scholarship Fund. 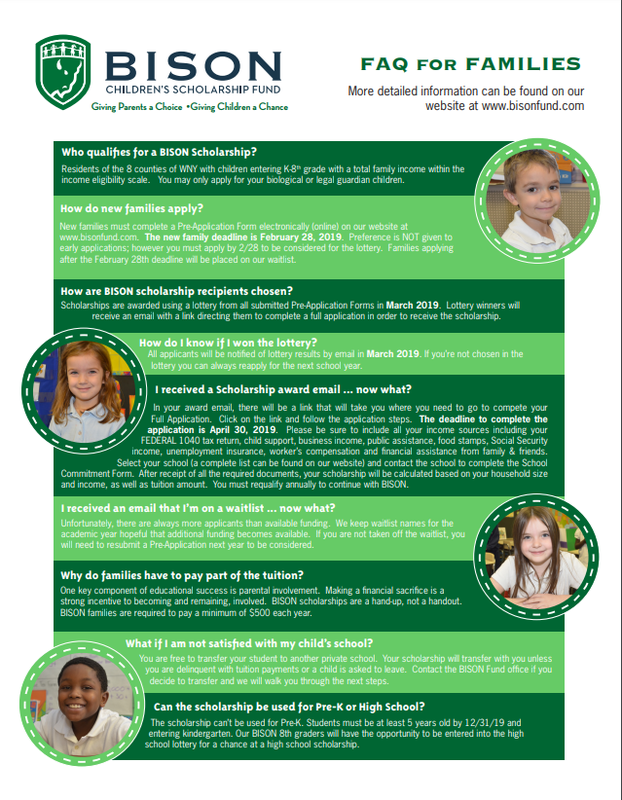 The BISON Fund is a privately funded tuition assistance program for economically eligible families with children entering grades K-8. More information including how to apply, please visit the Bison Fund website. The 2019 deadline for new families to apply is February 28, 2019. The income bracket information for qualifying for Bison is below. who desire a private education for their children but may be unable to afford it. Contact the school at 716-632-6146 or the BISON Fund at 716.854.0869 if you have any questions. 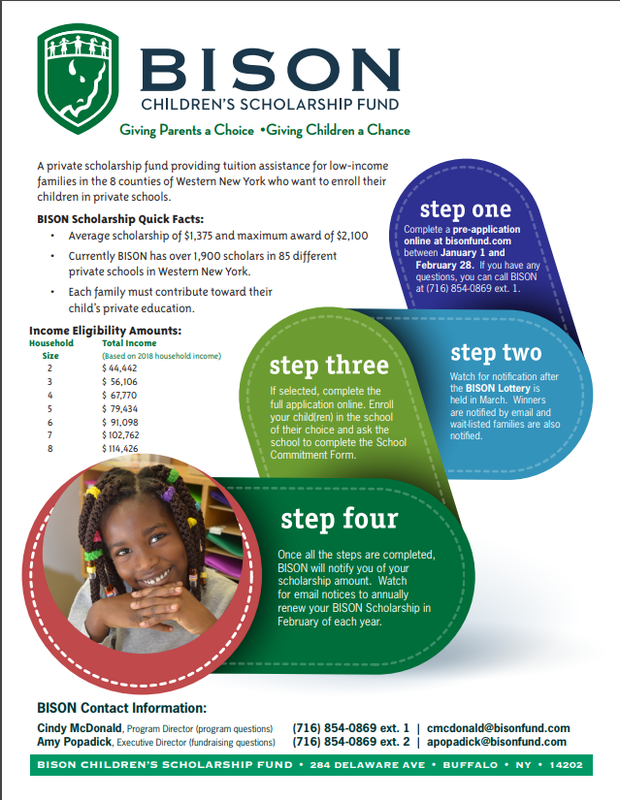 Scholarships are only for children entering kindergarten through the eighth grade. We don’t have funding for pre-kindergarten or high school. If you are currently receiving a scholarship in our program, you do NOT need to fill out a Pre-Application. Instead you will receive an email from the BISON Fund with renewal information. FAQ about the BISON Fund. 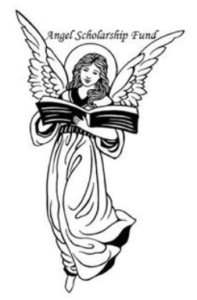 The Angel Scholarship Fund is supported by the generosity of our parishioners and friends of Ss. Peter & Paul School. The fund provides need based tuition assistance to families of Ss. 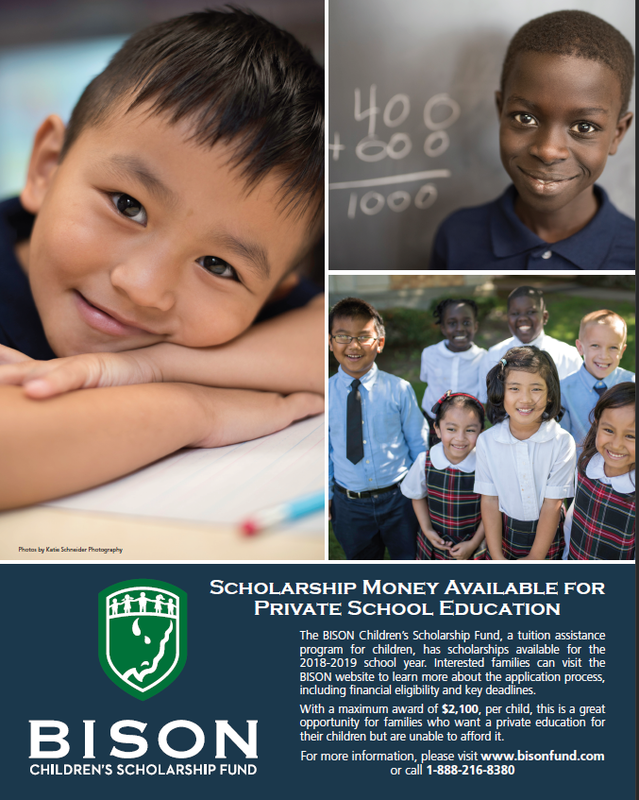 Peter and Paul School students who meet eligibility requirements based on fund availability. Applications are assessed by a review team to determine eligibility. You may be assured that all information required to determine need shall be held in strict confidence. Applications may be obtained from the school principal, Mrs. Deborah Lester, dlester@ssppschool.com.